Its been over a month now since I posted on this blog and its because I think I'm having more responsibilities! Anyways the major good news is that my wife gave birth to our daughter - Hadassah on Friday October 26th and since then I've known what it means for a young man to be 'responsible'. Well if you think you are responsible already, then wait till you have a baby! I'm so excited though and I'm hoping I'll be the best dad ever. So what else have been happening to me? I have successfully launched the Voting Solutions for the Celebrity Takes 2 TV show and viewers in Nigeria, Egypt, South Africa, United Kingdom, and the United States can now vote for their favourite celebrity dancer! 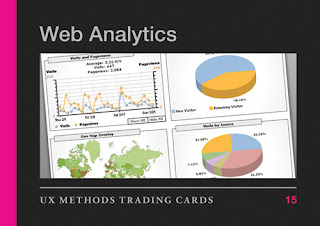 Apart from managing the SMS Voting solution project I've been looking more into Web Analytics. As a web consultant its imperative that I have a more strategic view of data gleaned from the sites I currently manage or will manage in the future. So whats my game plan? And anything else that will expand my knowledge base and experience in making websites more effective! If you're also interested in web analytics, why don’t you get in touch with me so we can tap each other's brain! To all my folks who want a lecture on Social Networking sites, I think this 2 minutes video will do the trick! The above video has been created by Lee LeFever and his team at Common Craft, who have also worked on other similar gems, helping users understand the complex world of RSS, Wikis, etc... in plain english. I've been thinking of the best way to explain what a strategic mindset 'looks' like, especially when I'm trying to explain it to people with no management background or just sharing ideas with young people. It seems to me that the strategic mind focuses on the long term, emphasizes sustainability, gives adequate time for quality research and ultimately decisions are made based on the findings from those research. Now that’s what I call strategy or the strategic mindset. However, I have noticed that most young people are high performers on the short term and even as important as that is, without taking a strategic view of things the results may not actually be sustainable on the long term. May be this is due to increased competition in the business environment and even society at large, but if the present generation will be able to build on the success of the past, then we need to start placing emphasis on developing the strategic mindset. Strategic thinking is the difference between a company that has survived many decades and one that is struggling immediately theres a change in leadership. It’s the difference between two graduates earning the same amount today but in 10 years time, one is a millionaire while the other will go bankrupt if he loses his job. The strategic mind is what makes a man leave an inheritance for his children's children. My dad will call that foresight. He will usually use the word for someone who saw an opportunity when others couldn’t see it, but the strategic mind is not just about foresight, its about one's decision making process. Placing emphasis on the opportunity costs or gains instead of immediate or operational costs or gains. "The worst aspects of leadership came from younger managers, especially those who were well educated, and intellectually very bright. They tended to make the worst decisions because they turned strategic concerns into operational concerns. They want to make an impact within eighteen to twenty-four months before they move on - the business, the profitability looks good, but have they actually invested in the long-term effectiveness of the brand? The answer is no. What we noted is that middle, i.e. younger managers tended to look at operational costs and operational gains, i.e. short-term costs and gains, rather than opportunity gains or costs, the impact of which takes longer to realize. " "From a survey in which I have been involved, covering 8,000 organizations across 14 countries, the overall finding is that leadership qualities are all learned." Now the last sentence seems to be where I'm heading to in this musing of mine…that leadership is connected to strategic thinking and if leadership qualities can be learned, then we can all develop that strategic mindset which makes us to produce not just results that are sustainable but also the right results! This has been in planning for the past 2 years and I'm so excited the show is finally going live. FOR THE FIRST TIME EVER in Nigeria, celebrities will participate fully in a reality TV show. 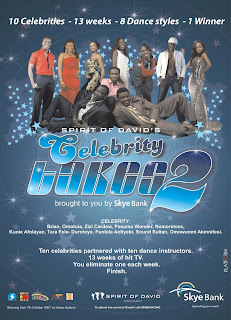 Created by the Spirit of David dance club and sponsored by Skye bank. Celebrity Takes 2 is Nigeria's version of Dancing with the stars. Live shows are being recorded at Planet One, Maryland, Lagos.For information on how to obtain tickets, please call 234-808DANCING or 07028055553. As the show will be on major TV stations in Nigeria, Africa Magic (Mnet), Ben TV (UK & Europe) and the Internet, you've got no excuse to catch this breathtaking show. The voting solutions is proudly brought to you by our company, Onecard Technologies Limited. 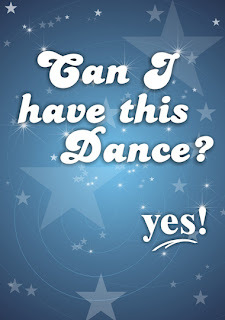 So who is your favourite celebrity dancer? What do you think about the show? Who do you think will win? Let the discussion begin! This must be the busiest period of my life in the last 5 years as I've got massive projects ahead of me and I'm just wondering where I'm getting the strength and the motivation to keep pushing ahead from. I must confess the last 3 weeks has been extremely busy and my wife has told me several times to try and manage some smiles and sleep early! Well for now that’s still a luxury. In my quest for a more balanced life I have set my alarm to remind me to sleep at 10.30pm everyday but unfortunately I have not been able to respect the alarm…not even once. I think I'll take some time off soon to refocus…may be in October but I must first put in perspective the pressing projects ahead of me. Yes Celebrity Takes 2 is a couple of weeks away! The networks in Africa just gave us a shocker yesterday by tripling shortcode rental fees! Still don’t know how I'll fix that into the budget. All in all, I look forward to a great show in the next 16 weeks and also the great learning experience it will afford me as I manage my first international project. 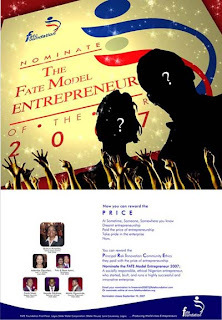 FATE Alumni Model Entrepreneur Award) is to celebrate successful and ethical Nigerian entrepreneurs, who have distinguished themselves in their enterprises, and then offer them as credible role models to inspire budding Nigerian entrepreneurs as well as FATE Entrepreneurs. FATE Model Entrepreneur Award seeks to recognize and celebrate ethical Nigerian men and women who have successfully established a fast growing business, created employment as well as contributed to the fostering of other businesses in the country. FATE’s hosting of the FME Award is driven by the need to rectify the dearth of role models in the Nigerian society; a dearth which is at the root of the decay in values in the society and the festering of sharp and corrupt practices. FATE’s belief is that searching for such inspiring and respect-commanding Nigerian entrepreneurs through a very competitive and transparent process, would help identify people who have through hard work, ingenuity and tenacity traversed the rough and sometimes hostile Nigerian business terrain and struck success, celebrate and present them as role models for other Nigerians to aspire to. Transparency is one of the tenets of the Foundation, and the process for selecting the FME is done as openly as possible. Nominations for FME are called from the general public through advertisements in the print and electronic media. The FME Award committee reviews all nominations and using the approved selection criteria, prepares a shortlist of awardees. This is followed by extensive interviews with staff and client of the nominees’ organization as well as the nominee, to further ascertain that they match the profile of FME. Nominations (online: www.fatefoundation.org; email: fmeaward2007@fatefoundation.com) to include Name, Business and Contact details (if known). Please forward to your network to help us discover those men and women who are transforming the society through their businesses. "...Young Nigerians in the United Kingdom Discuss the Nation's Future"
The role of any nation's Diaspora in its development does not need any debate. For Nigeria, the role of its citizens in other nations cannot be ignored, especially when consideration is given to their size and the inspiring roles that they play (or will eventually play) in those countries where they presently reside. The size of the Nigerian Diaspora in the United Kingdom -- from students to professionals -- places additional responsibility on the shoulders of both the Nigerian nation and her people in the United Kingdom. While the citizens can use their various platforms of influence to engage government (and contribute their own quota) towards improving living conditions, they can also benefit from the emerging opportunities that are increasingly available in Nigeria. Celebration of "What's Great About Nigeria" because if we don't, the world won't have an example to follow! Featuring brief keynotes, break-out groups, panel discussions and qualityquestion-and-answer time, the conference will deliver on its promise of kick-starting a process of networking ongoing efforts towards addressing theneed to place Nigeria on its path of becoming one of the best places to callhome during the first quarter of the 21st century! The conference will be delivered through the joint efforts of Netwox Limited, Paradigm Initiative Nigeria, and other partners. Netwox Limited will serve as the coordinating institution for the conference, and Paradigm Initiative Nigeria will be responsible for the post-conference coordination -- including the publication of conference proceedings and management of the post-conference process as decided by the participants. I have always believed wealth creation by entrepreneurship is a more credible and sustainable way of giving back than giving aids. More like the principle of teaching someone how to fish vs giving someone a fish. Entrepreneurship paves way for wealth creation, which also creates jobs, improves living standard and ultimately contribute to economic development. As an entrepreneur I have always had this dream of an angel investment company / micro finance bank and plans for that is still in the pipeline. However like I said in my previous post on giving back, you will always have opportunities to make small contributions and that is why I'm very interested in what Kiva.org is doing. The website helps entrepreneurs in developing countries to access loans from different people all over the world. Thanks to the power of the Internet…now a poultry farmer in Nigeria can get loans from someone he or she doesn’t know in the United States. A carpenter in Cambodia can also get connected to a lender like me in the United Kingdom and all of us together are making the world a better place. We are doing it not just by giving money as aids and then they come back later, but we're making contributions in a more sustainable way by empowering them to build businesses. Kiva.org allows individuals to make $25 loans to low-income entrepreneurs in the developing world (microfinance). By doing so, individuals like you provide affordable working capital for the poor (money to buy a sewing machine, livestock, etc. ), empowering them to earn their way out of poverty. It's a new, direct and sustainable way to fight global poverty, and the way I see it, you get a higher return on $25 helping someone build a future than the interest your checking account pays. Anyways, if you have a minute, please check out the site: http://kiva.org. If you need more "reputable" validation than my recommendation :), know that they have received great press in publications ranging from The Wall Street Journal to NPR to BusinessWeek. There's been a massive shift in the way I think about giving back to society recently. I have always concentrated on my business and family and expect to give back to society in a substantial way when I've made so much money or when I have so much experience to share. My recent paradigm shift has been largely influenced by further research I have done on the principles of growth and national development. I suddenly realise that even though a strategic input will give the utmost long term result, little contributions on a consistent basis paves way for opportunities to influence policies that can then create a strategic input. Now I've got my calendar full already and I'm really scared for my schedule, but what has to be done now should not be postponed till tomorrow. I'm also scared because some of the things I will be doing in the next couple of months to give back are things I haven't done in a long, long time…like speaking to the 18+ at Lifeline who are about starting their degree programs at various Universities in the UK. Its been a long time since I spoke to young people and I just hope I can contribute something of value to these boys and girls. I wish I had someone to share some experience and tips with me before getting into University as it would most likely have equiped me better and given me a more accurate view of life. I am also looking forward to the Nigerian By Choice Conference taking place on 15th September. When Gbenga Sesan first told me what he had in mind as regards the conference and if we could work together to make it happen, I remember him asking if it tickled my fancy, ''yes it sure did'' I said ...I just realised I could no longer give excuse of not giving back because I haven't made millions or got a P.Hd. I also didn't want to be part of people who only saw problems and could analyse it. I wanted to go beyond that and be part of the select few, who would create and be the solutions to socio-economic development in Africa. We will never be fulfilled in life if we don’t do things that are beyond ourselves, if we don’t do things for the benefit of others, if we don’t give consistently, if we don’t do things in which we expect 'no reward'…yes we will definitely be limiting ourselves. To people who are also waiting to make that 'big' contribution before they give back, I'll advise you to start where you are now. You may never be given an opportunity to do something big if you have not contributed in small ways. As more and more people find more ways to give back to society, we are creating a launch pad for sustainable socio-economic development. The first piece I got from my archive really got me thinking about who I am vis a vis the things I'm trying to do. I know there has to be the right balance so you don’t use the excuse of not having full knowledge to live in complacency or inactivity. As I read through things I wrote, some of them more than 7 years ago, I'm drawing inspiration for the next phase of my life and I'm staying close to the 'fire'. The last piece I posted from my archive also provoked a deeper thinking on the issue of average. According to wikipedia, it 'refers to a measure of the "middle" or "expected" value of the data set'. In simple English it means 'its just ok' it is expected so not exceptional. As I'm musing over what it takes for me not to live an average life, thinking about what it takes to give back successfully, I came across a piece I wrote almost 7 years ago titled Giving Your Best. It made me know You can't pass through this world unnoticed if you have cultivated the habit of giving your best. Yes putting your best into life - into whatever you're doing. Hans Christian Anderson says '' to be of use in the world is the only way to happiness''. The people that are of 'use' - relevant people are people that have learned to give their best. Never stop to give your best anytime your contribution is required anywhere, put your best into life..(you've only got one chance anyway!). If after giving your best and your best is not good enough, then go back to the drawing board of your mind, think through, study, learn more from superiors, pray and then start again. Becoming successful is firstly a state of the mind, it's a mindset that puts in the best for any seemingly little task. As Dave Carnegie observed, '“Don't be afraid to give your best to what seemingly are small jobs. Every time you conquer one it makes you that much stronger. If you do the little jobs well, the big ones will tend to take care of themselves''. Most young people want to do very well but they don't like to do 'small' things, they fall into the trap of thinking 'big' and forget that its in the process of doing small things consistently that you achieve the mastery to be successful in big things. How do you know if you will end up an average person? When you are not consistently giving your best to what you call small, this consistently reduce your opportunity to sharpen your skills on a regular basis. When challenges of life overwhelms you and when you are constantly thinking may be you need some time off work or your business, then its time to go through your archives..to remember the landmarks or milestones you have passed through in life. When you are beginning to lose that trust and faith in your abilities, when you're constantly thinking if your aspirations are worth all the troubles, then its worthwhile to think through what you've been through to get to where you are today..and that’s exactly what I'm doing this week. I have so much in front of me, that in the dead of the night I'm just wondering if I'm not running crazy or if these things are possible at all. Then I went to my old file that contained all the stuffs I used to write and scribble down back in my university days and there I found great strength and resolve to forge ahead... So this week I'll like to share some of those writings with you..it did inspire me and many of those around me 7 -10 years ago and I do hope it is 21st century compliant! I hope in those pieces of mine you will find a great resolve to remember where you're coming from and the things you desire to contribute to make our world a better place. Everyday throughout this week I'll sort through my archives and post any piece that I find to be inspirational, impactful and could be relevant to you. Why are some people more successful than others? I thought diligence, discipline and prayers are enough to make a man / woman successful...Someone says 'I've tried my best but yet still failed...I did all I know to do yet it amounted to average. Our attitude or personality goes a long way to determine if we will be outstandingly successful or not. I believe success comes not by much 'doing' but by much 'being'. A man's success lies in who he actually is, not what he does. There are some attitudes or personality traits that must me persistently cultivated for a man to be a success. Attitudes, Character, Motives, Purpose are powerful expressions that must be properly understood before launching out to fulfill a specific task. Who are you? What is the reason for doing what you choose to do?